My latest Stitch Fix arrived this weekend, and tho I’m not modeling any of this for you, I snapped a quick picture so you could see what I got. The tank top in the center, though fitting on top ended up being a little small in the hips– very sad since I LOVE the style. However it looked perfect on my 13 year old daughter Emily, so I think we’ll keep it for her. 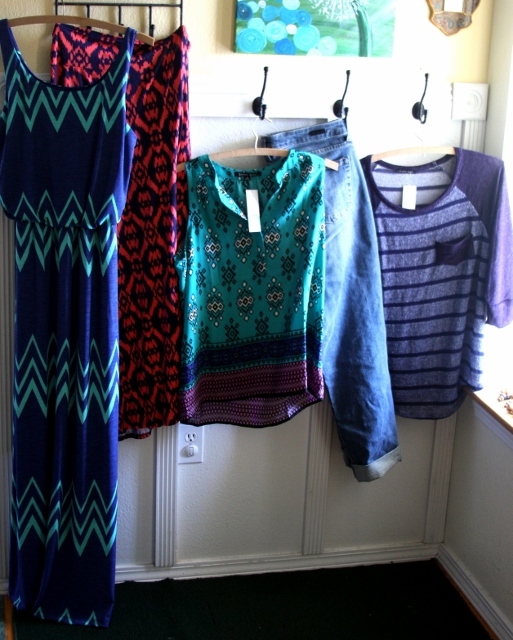 The striped shirt on the far right was nice and I could imagine wearing it a lot. But is very similar to a couple other tops I hav, so back it went. The chevron dress is hands down my favorite piece. Even though I am not at my trimmest these days, it is very flattering and my hubby really loves it. The only down side is that the underneath lining ends just above the knees, which I don’t expecially adore. The ankle-length boyfriend jeans fit nicely and feel good– I was very surprised to get such a nice fit in jeans, since jeans tend to be so hard! The coral/navy maxi skirt is lots of fun– it is definitely going to Ethiopia with me, along with several other maxi skirts. Awhile ago a friend (when complimented on how nice she looked in a maxi skirt) said, ‘They’re like sweats without a crotch– they’re so comfy!” I laughed at her description, but it is so true. Maxi skirts look AND feel awesome and they tend to be wrinkle free. Love them. And I think they’ll be especially nice in Ethiopia where we’ll be traveling constantly, AND modesty standards are a little higher than in the US. Have you tried Stitch Fix? If you’d like to give this service a try, just click on my referral link. I got that same maxi dress in my last stitch fix and LOVED it. But, it had a small hole in the back on the left side (I think) right around my hip/bottom. Check yours to make sure it’s not the same one! I sent them a message when I returned it to make sure they knew. I would have purchased it otherwise because it was so flattering!